If your church needs kneelers, you’ll want to consider them as a vital part of your church pew search–after all, most churches that use kneelers spend almost as much time kneeling as they do sitting. High quality kneelers that provide comfort and support are important to getting the best church pews for your congregation. The best church pews with terrible kneelers will make a lot of people very uncomfortable and unhappy, even to the point of not attending church services if they cause pain. Kneeler supports, or the part that sits on the floor when a kneeler is flipped down, should be made out of solid wood to be really durable. After all the slamming up and down they might endure throughout their life, it’s important that the wood can take a lot of abuse. Oak, what we use in our church pews, is a great wood for this job because it doesn’t have much give as compared to other hardwoods and doesn’t crack or split as readily as other woods. It’s also very beautiful and matches the other parts of the solid oak wood pew supports. Kneelers should also have a support in the middle of the kneeler so it doesn’t sag or break over time. As well as durable wood materials, the kneelers should have a sufficient amount of padding to stand up to lots of pressure. When you’re kneeling, almost all of your weight is directly on your knees, which means that the pressure is distributed over a small area than if you were sitting. Knees are also pretty fragile, especially for older members of your church, and padding is required for them to be able to kneel, let along comfortable. Kneelers should be covered in high-density foam to provide durable support that will last. We use the same high quality foams on our kneelers as our church pew seats. When you’re selecting kneelers, asking what types of fabrics are used and connections for the kneelers to the church pew ends and supports. 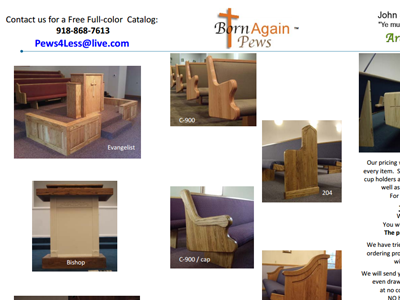 We use highly durable olefin fabrics on our church pew seats and kneelers and connections for church pew supports that are custom made as part of our kneelers. Because we make each piece individually and fit the kneelers to church pews, they fit perfectly without catching or scratching the church pews themselves, preserving your investment.